This book presents a comprehensive review of the state-of-the-art research on water treatment methods for the removal of cyanobacteria, taste and odour compounds, and cyanotoxins. The topics covered include practically all technologies that are currently used or are in a state of research and development e.g. membrane filtration, adsorption, biological treatment, chemical disinfection-oxidation, advanced oxidation processes, reviewing their effects on cyanotoxins with regards to degradation, detoxification, mineralization and relative mechanisms. The book highlights strong and weak points regarding the applicability of these techniques on a large scale, discusses issues regarding the quality of treated water, and identifies research gaps and future research needs on the topic. Topics covered include: * Introduction to cyanobacteria and cyanotoxins * Cyanotoxins and human health * Physical treatment for the removal of cyanobacteria/cyanotoxins * Biological treatment for the destruction of cyanobacteria/cyanotoxins * Conventional disinfection and/or oxidation processes * Advanced oxidation processes * Removal and/or destruction of taste and odour compounds. * Integrated drinking water processes. * Transformation products of cyanobacterial metabolites during water treatment. The book concludes with a section of case studies and real life examples, followed by a review of the research gaps and future perspectives. This book has been developed within the frame of the COST-funded CYANOCOST Action http://cyanocost.com/index.php and is edited by experienced scientists in the field. 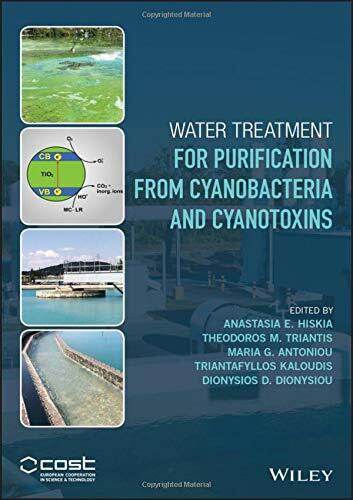 Chapters are authoritative and written by an internationally recognized team of experts in specific research topics related to water treatment for purification from cyanobacteria and cyanotoxins.